Rosie had a venerable collection of talismans for emergency readiness, the most impressive of which was her waterproof to-go knapsack. In the straining nylon, objects of survival interlocked like a box puzzle: a water bottle, batteries, socks, bar soap, toothpaste, two cans of navy beans with the easy lift-off top, candles, and a lighter. On her coffee table, a flashlight rose singular and stark, a miniature testament to her readiness, a silo of technological fortitude. She had been lucky to get it. Yesterday, under a sky bloated with the weight of the impending storm, she had fled from store to store ravished by panicked consumers, finally spotting a corner of a flashlight’s plastic casing that had slipped behind a rack of sympathy cards at the pharmacy. Rosie was about to click a link to “HEAVY WINDS TOPPLING TREES IN 2 DEATHS ALREADY” when she heard a bang outside. She hurried to her first-floor bedroom window. There wasn’t anyone at the door, just a small Halloween decoration of a homemade cloth ghost flapping on a string. The upstairs tenants were out of town and had texted asking if she could please bring in their yard decorations before the storm. Rosie had gathered everything else, but when she’d gotten to the dirty fabric and cavernous eyes of the makeshift ghost, she decided she would say it blew away. Back inside, she picked up her flashlight. She ran her finger over the button on the back, pressing it in and out to make sure it still worked. Another bang and she jumped. Neighbors or the police for evacuation? She went to the building foyer and pushed the front door open against a wind that felt like it wanted to rip the door right off its hinges. A man squinted at her. Next to him rested a laundry cart of garbage bags flecked with raindrops. Rosie blinked at him. The wind whipped her hair to one side and she tried to hold it down with one hand as the other braced the door. The wind snatched the words off her tongue. She tried again. “Can I help you?” she shouted. His eyes, caught between folds of skin, cast blankly behind her. Ends of gray hair moved beneath a winter cap. His whole face was the mealy texture of unbaked clay. She might have passed him before and not realized it, outside by the bus stop, where she always kept her eyes averted and clutched her purse as folks shuffled around, asking for change or muttering to themselves. A gust of wind roared and his cap blew off, sending the gray strands dancing manically. His cart squeaked in protest and they both watched it clatter down the sloped street and out of sight. He turned unfocused eyes to her, opened his mouth, and closed it again. She’d have to invite him in, she thought with a sinking feeling. After all, she was a Good Samaritan, she couldn’t let him stay out here in the worst storm in recent history. She looked down the street at the rows of faceless townhouses and felt for a moment that they were the only two people for blocks. A few drops of rain fell on her bare arms. He could stay in the basement, she thought suddenly. She wouldn’t have to invite him into her apartment, and she wouldn’t feel guilty for abandoning him to the storm. “You can wait it out downstairs,” she shouted, gesturing with her free hand and stepping back. Once the door was closed, she smoothed back her hair and looked at him again. He was so pale, as if his skin had never seen the light of day, except for mottled marks across his cheeks that reminded her of fruit beginning to overripen. His hands gripped a tired gray knapsack. He didn’t seem dangerous—though she knew better than to let her guard down around a stranger. A smell emanated off of him, pungent and unwashed, and she tried to hold her breath. He followed her down the unfinished, paint-splattered wood staircase to the basement. He slumped against the wall between her storage closet and the dryer and closed his eyes and she thought maybe that was fine, he could take a nap until the storm passed. In the living room, she stopped dead in her tracks. She bent under the coffee table, lifted the couch cushions, checked the kitchen. After a few minutes of searching she gave up, collapsing onto the couch in a fit of frustration. An hour had passed since she had let the homeless man in. Rosie had placed electronic tea lights around the coffee table as a replacement for her flashlight, and the rain had turned from a slow tapping to something more furious. She peered out into the street again from her window to see a strange purple hue to the sky, the wind a low, persistent whine. She pulled her lace curtains closed, the fabric catching and soothing her eye. She had always loved miniature patterns: the entwining leaf motif on her tablecloth, plates with delicate floral borders, the hand-painted details on the Russian nesting doll collection smiling from the shelf in her hallway. As Rosie walked back into her living room, she heard a hum. She cracked her apartment door and listened. The washer. She ventured down. He had cleaned up and stripped down to fuzzy long johns and a long sleeve shirt that hung in sags. Crumpled paper towels lay like flowers around him. Some color had moved back into his face and he was humming a little to himself, sitting straight against the wall and going through his gray knapsack with a particular fervor. He continued to hum something familiar but not recognizable as he took out items from his knapsack—a folded piece of ragged, once-white notebook paper, a letter opener, empty cereal bar wrappers, and other useless things—and stuffed them into the small trashcan that sat by the washer. He didn’t look at her. She skulked back upstairs and into the apartment. In one kitchen cupboard sat a small army of jugs of water. She couldn’t spare a whole gallon—water was the most important thing in a disaster, after all—but she could bring him down a cup of tap water. Above the sink, stacks of alphabetized-by-brand cans of soup, vegetables, and beans stood by to deliver their reassuring, heavily-preserved nutrients. The bathtub and every large pot were full of water. She would be fine through the storm. She was utterly, completely prepared. On the staircase, she left the water and a box of whole wheat crackers on the last step before darting back into her apartment. She cracked her bedroom window open for a second. The trees and power lines swayed and she watched it for a few minutes, waiting to see if anything would fall. The invisible eddies of wind spun, knitting themselves up to a frenzy and she pictured herself being plucked right up, sent sailing along the currents until she was swept out into the dark sea beyond the harbor a few blocks away. In her living room, Rosie watched a New York woman with unpolished crystal chunks hanging from her neck tell an aghast reporter that she was going out into the storm to connect with Mother Nature. The news segment flashed to an older man in New Jersey wielding a metal detector and talking enthusiastically of the washed-up treasures he’d find during the storm. When Rosie went downstairs again, the man was looking through her storage bins. He moved quickly, rummaging through them, the bare bulb from her open closet casting a blade of light across his hands. “Um,” she said. She didn’t want to aggravate him in case he became angry or violent. She began contemplating the sensibility of calling the police when she saw he had put two books to the side. He’s just looking for something to do, she thought. And she couldn’t really blame him for wanting to read. Rosie was about to turn to leave but did a double-take, staring at the bins. She could have sworn her storage bins were blue, but these were brown. She blinked and moved closer to touch them. It must have been the light, maybe warped by the hurricane somehow, but they still definitely looked brown. Next to the bins, a face on the cover of one of the books seemed to fix on her with a manic grin. The paint speckles on the wooden stairs shifted as she walked slowly up. There’s something wrong with my eyes, she thought. He hadn’t looked at her once. Rosie stared at a photo of a shark swimming next to a flooded suburban house’s porch. For some reason, the photo deeply unsettled her, the black smear beneath the water, the shadow of a fin. A fake, she decided. A sudden, hard rap at the door. She thought of the ghost decoration and shuddered. Ignore it, she thought. Nothing good came of her opening the front door today. She unplugged her phone, turning it in her hands. She had called her family that morning, telling them not to worry if they didn’t hear from her since the power would probably go out. But they were the anxious type, and surely they would have called by now to check on her? Her phone was silent even though three bars of reception held steady. 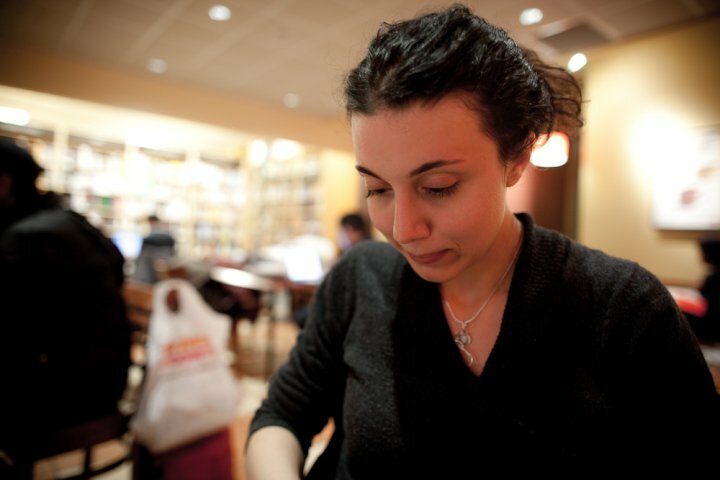 On her computer streamed photos of water gushing into subway stops, houses with the façades torn off and cars floating down the street. The storm was still gathering power, moving north toward her. Nothing is really ours, she thought. Clatter, clatter. Like someone throwing metal trashcan lids at the front door again and again. She clapped her hands to her ears and decided to venture downstairs again. Her guest had pulled out a neon green lawn chair from her storage unit and was leaning back, munching on the crackers and flipping through an old Sherlock Holmes book. Two candles burned on ceramic holders on top of a boom box by his feet. The empty gray knapsack lay like a discarded skin on the top of the trashcan. He looked more clean-cut, his hair shorn from some scissors he must have found in the basement. She touched her own hair, which felt heavy and greasy and gnarled. She opened her mouth but he hummed and she stopped. She thought she might say “You must prepare to leave immediately” or even “Get the hell out” though she rarely cursed, but the words retracted and shrank, tumbling back down her throat. She stumbled upstairs. The noise was louder at the door—clatter, clatter, clatter. Her phone was missing. She threw the cushions from the couch, pushed the coffee table out of the way. It was on the floor, its face blank. She snatched it up, plugged it in, and jabbed the power button. Nothing. She popped the battery in and out. “Work, you stupid thing,” she said, jabbing the power button. She tossed it on the couch and went online to email her parents but the browsers weren’t responding. “The mind can only handle so much change,” she said aloud, staring at the blank screen. It sounded like a very logical statement. She would put out her work outfit for the next day, as she always did. She always wore pants, never a skirt or dress, never jewelry that was too flashy. The storm would pass and she would listen to her coworkers exchange stories of who had lost power, who had dealt with flooding. It seemed like she had less to choose from than before, and she lifted up a blazer and set of pants out of the closet, both far too large for her. She turned a blue crisp men’s shirt on a heavy black hanger. “From the old tenant, of course,” she said. Somehow, the previous tenant must have had left clothes in the closet, that she had missed when she moved in. “How irresponsible of them,” she murmured. Rosie sunk to the wooden floor, covered by a new red carpet. Her landlord must have placed it there without her noticing. Just then, the power went out. She grabbed an electronic tea light and went to look out the window through the curtains. 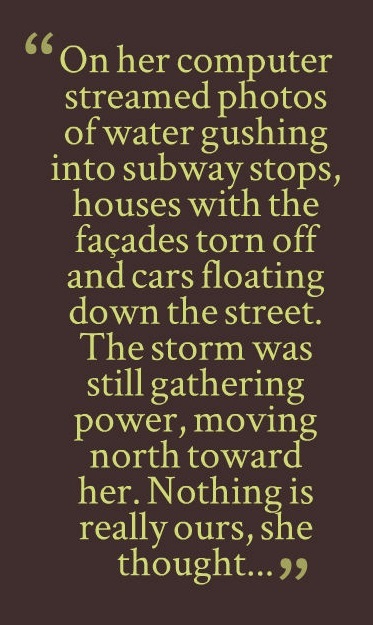 The streetlamp flickered over the rapidly flooding street. The ghost decoration twirled like a frenzied dancer between streams of rain, before it tore off and raced into the darkness. She started to pull the curtains closed and froze. The fabric—it had bold, dark splotches across it. She brought the tea light closer. Those were definitely big, stark strokes of color, something she would never choose. “I’m in the wrong apartment,” she said. Shapes moved around her and she stepped back from the decidedly not-lace curtain. It was him, she thought. He’s poisoned me somehow, he’s making me hallucinate. An aerosol attack. A reality TV prank. She moved into the kitchen, picking up objects she no longer recognized: records (she didn’t even have a record-player), and the kitchen was missing her coffee maker, her ice cream machine. Her hand groped in the dark empty space above the kitchen counter, faster and faster, knocking over jars and bottles of things she couldn’t place. She threw the unmarked, unnamed jars to the floor, listening to the glass tinkle. She had to find a pay phone, call her family or friends but she couldn’t remember anyone’s name; her mind was as blank as her phone screen when she tried to think of one. “Surely I must know my own mother’s name,” she said to herself. Dreading it, she reached up to the shelf that housed her beloved Russian doll collection. Her fingers brushed empty wall, the paper edges of a calendar. She slid to the ground and sobbed just once, loudly. The wind was like a train tunneling into all the windows at once and she rubbed her ears. She heard the tree trunks in the back yard groan, as if they were pressing into the wall, about to crush her. Still she heard the clattering at the door, like someone hurling iron pots. “What is that sound?” she screamed and caught her breath, breathing hard. She tore into the hallway, her heart catching in her throat like a swollen mass of cotton. She would shove him, punch him if she had to so he’d say something, so he’d look at her. “What have you done?” she squeaked, her voice swallowed by the darkness, the wood and brick moaning around her under the weight of water and air. She felt her way down the stairs. But he wasn’t there. He was a step ahead of her. She had been readying herself for the wrong thing. She started to stumble on the last step but caught herself. The clattering at the front door was so loud she wanted to scream again. That hum, that inane hum. What was that song? She had told herself she wouldn’t open the door again, it seemed to only bring trouble, and yet the noise was too loud to ignore. She opened it, a rush of wind barging in and wrapping itself around her. His cart was there, pressed up against the door, stripped clear of its things except for a single translucent plastic grocery bag wound around one of the bars. To the west, the sky was a bruised darkness. The rain flung down, everything dripping and shimmering. A thin sheen of water lapped at the sidewalk, sloshing over from the street. Next to her, APT 1 was missing her carefully printed last name. Instead, a handwritten “DANIEL C. CLARKE” was crookedly pasted there. She reeled for a moment. Of course it was a dream. 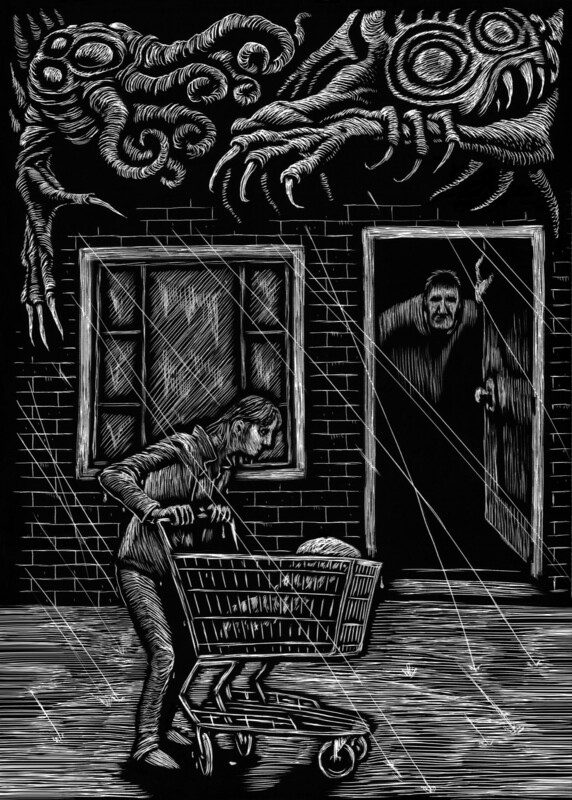 She wrapped her fingers around the cart handle, pushing it away from the door to the sidewalk. Water sloshed over and into her slippers and the rain beat into her skin. When she turned back he was standing there, blocking the doorway, shiny new glasses reflecting blurry orbs of the streetlight and masking his expression. Daniel put something down, and nudged it with a shiny, dark shoe toward her. Her to-go bag. The woman thought of the cans of soups and vegetables and jugs of water and was going to ask if she could have them as well, but for the first time Daniel seemed to look at her sternly, and she bowed her head. “It’s my apartment,” she whimpered, but the wind ripped into her mouth and tore the words away into the silent open. She was about to try again to speak but felt the wind waiting, ready to pounce. From one of his casual fingers, as though it had always been there, hung a keychain with door keys, car keys, laminated membership cards. Behind him, she heard a dog bark a warning. She felt a pinprick of tears but reached out to take the blue bag anyway. As soon as her fingers brushed the nylon she felt the ties sever completely. Neighbors, family, work, all of it, gone, in one gasping breath. She was slipstream, caught somewhere that didn’t matter while he belonged here now. She could only feel one tether: the winds snaking around her. The full moon broke through the murky tendrils of fog and clouds and she could see the tether for a moment, stretching from above to tighten around her until she could displace it onto someone else, in another storm. She hummed a little to herself, feeling the vibration of her voice against her throat. The winds would allow that. The woman was prepared a little, at least. She lifted the reassuring weight of her to-go bag into the cart, the bag that held her batteries, her soap, her plastic bags, and her notebook. The wind tugged her cart in the direction of the receding storm and she took a step. The front door slammed. If you enjoyed this story, let know by commenting — and please use the Facebook, Twitter, and Google Plus buttons below to spread the word. KC Grifant is a technology writer who, by night, writes stories that are vaguely horrific, somewhat fantastical and often scientific. KC is also contributor to the horror-science fiction anthology, What Has Two Heads, Ten Eyes, and Terrifying Table Manners? Visit @SciFiWri or SciFiWri.com to learn more. K.C. ‘s tale could have been the basis for an episode of Rod Serling’s classic, “Twilight Zone.” The narrator was prepared for everything…well, almost…Cosmic in a sense, how transient are all the things we depend to say, “This is me, I am here, I exist…” Thanks K.C.! Thank you, John. The Twilight Zone, Stephen King and classic horror tales are all an inspiration. And kudos to Dave Felton for a wonderful illustration–I couldn’t have imagined more fitting artwork! Grifant takes readers through an original and horrifying nightmare. The powerful imagery, build up of suspense and eerie atmosphere creates a fantastic read! This story has a real bite to it; as I get older, and have my share of “senior moments,” not being able to come up with the right word, having to hesitate before entering the PIN number after swiping my debit card because I am not one hundred percent sure I have remembered it correctly, it is easy to imagine a version of the stranger in this tale finding his way to my own door. As Stephen King said, the artistic value of the work of horror lies in “its ability to form a liaison between our fantasy fears and our real fears,” and by that measure, you have succeeded very well.